Weekly Samskara Vargas (Moral classes) were started in 4 villages for those children who are not in contact with our school. Our school teachers are conducting these moral classes every Saturday for one and half hour. The purpose of the Samskar varga is to bring them near to our culture and heritage, inculcate good values and all round development of the children. So that they will become a good citizen of country. Moral classes consist of patriotic songs, Bhajans, Surya Namaskaras, Indian Games, significance of our culture, customs, traditions and fastvals, moral stories from Purana, Mahabharat, Ramayana etc. 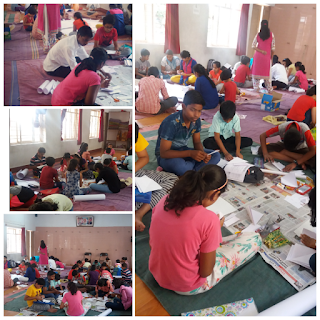 Residential “Personality Development Camp” are organized for the age group of 12 to 15 every year during the Summer Vacation. Weekly Swadhyaya for our teachers is organised in which teachers read the books and discuss the subject matter.